Wigan boss Uwe Rosler says he hopes to use some lessons he has learned from Roberto Martinez when the Latics face Arsenal in the semi-final of the FA Cup at Wembley on Saturday. Martinez guided Wigan to FA Cup victory last year, before leaving to become manager of Everton. Last Sunday, he oversaw the Toffees' 3-0 defeat of Arsenal in the Premier League. "It was another very impressive lesson from Roberto," said Rosler. "Everybody knows Roberto is focused on ball possession but how well the team worked against the ball at the beginning of game was very impressive. "There were good pictures for me to learn from and also take one or two things on board." 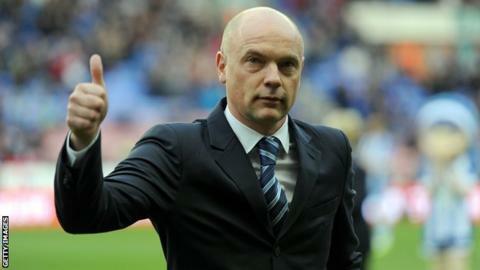 Rosler already has pedigree of beating Premier League sides in the FA Cup, having guided Wigan to victories against Crystal Palace, Cardiff and Manchester City. Consequently, he does not expect Arsenal to underestimate the Championship side. "I think they will be expecting a team that is very much on the front foot from the beginning and wanting to win the tie early on," he added. "The longer we can stay in the game, the longer we can create uncertainty around Arsenal supporters, the better it is for us. "There is a little bit of unrest there, expectation is sky high and the longer we are in the tie the more difficult it will be for Arsenal."